Arthur Miller’s Death of a Salesman seemed to take its place in the canon of great American literature almost as soon as it deputed on Broadway in 1949. The play hits upon themes which have proved to resonate the world over but also has particular meaning for American audiences. Miller’s play ostensibly presents an idea American family, a devoted mother, a hard-working father, and two grown children with all the advantages of an American middle class life. But we quickly realize things are wrong with this family at the outset of the play. Willy is not quite the hard-working father he thinks he is. He is losing his mind as his world shows itself to be filled with contradictions and disappointments. His son, Biff, has not turned out to be the young man Willy imagined. Willy’s career is falling apart. He is lapsing into delirium and suicidal despair. The play reveals the cracks in the myth of the American dream, that myth which says that anyone can be a success in America if he or she just works hard. And the people who are at the center of this dream are not quite the middle-class ideals we like to believe. They are riddled with self-doubt, insecurities, and hypocrisy. Miller presents these themes within the dramatic form of a tragedy. 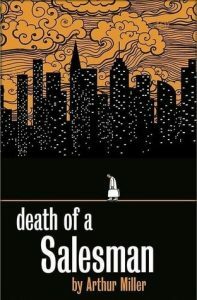 The play follows a trajectory in which the protagonist/hero, Willy Loman, falls to complete ruin. But Willy is never a tragic hero in the true sense. He was never a “great man” of the type we see in classical drama. Nor is he quite an “Everyman” as are the tragic heroes of so much Renaissance drama. Willy is no one special. He is just an ordinary man with evident faults and flaws. His fall to ruin is almost meaningless. It would seem Miller’s portrayal of a middle class American family was accurate in many ways. The play was enormously popular in its time. It has never fallen out of favor with audiences, reader, or critics. It is now considered to be one of the finest dramas in 20th Century American literature. Death of a Salesman is still finding its way on stages all over the world, as if the themes and conflicts of this mid-twentieth century play are timeless. Films and television productions have followed since it first appeared in stage.